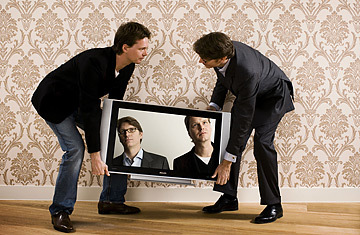 Joost Founders Janus Friss (left) and Niklas Zennstrom pick up a television set inset with images of themselves. Once you've sold a company for $2.6 billion, life on the beach can be tempting, particularly if you're Scandinavian. But for dotcom veterans Janus Friis, 30, and Niklas Zennstrom, 40, whose sale of Skype to eBay rocketed them toward Gatesian wealth, the lure of a Great Leap Backward has proved stronger than sun and sand. Having launched Kazaa, one of the first music-file-sharing networks, in 2001 and Skype, the first big Internet-powered phone service, in 2003, the duo began work a year ago on a secret venture dubbed the Venice Project, whose goal was to bring yet another disruptive technology to your computer. "We took a 'lean-back' approach," says ceo Fredrik de Wahl. "On the Web today, you have to know what you're looking for, lean forward and click. But we wanted people to be able to just lean back and watch." In other words, just like network television circa 1964. That's a revolution? A potentially huge one. For years, Microsoft and others have tried, and failed, to bring the Net to TV screens with duds like WebTV. But the Venice Project, renamed Joost (as in juiced), is doing the opposite: moving TV to the Internet. And unlike Apple TV, Slingbox and other hardware offerings, Joost requires nothing more than software. For now, it's by invitation only, but by this summer it will be open to the public. You'll download the free Joost software, then use it to watch channels ranging from Lime, a lifestyle station, to National Geographic. And potentially thousands more, from anywhere, in real time  and without the stuttervision that dogs streaming video today. It's the creation of a team of 60 top engineers  veterans of Apple, Flickr and Firefox  and has already wowed bloggers who have had an early look. "Joost could make YouTube, Google Video and Apple TV look like 1988," gushes tech-blog UtahSaint. Viacom, which recently yanked its programs from YouTube, has signed a deal to supply Joost with movies from Paramount and programming from mtv, Comedy Central, Nickelodeon and other stations. Time has learned that Joost will soon announce another big deal  with JumpTV, the world's largest distributor of international TV stations, to begin distributing programming from some of the 270 stations in 70 countries that JumpTV owns rights to. The deal will launch with prerecorded Spanish and Arabic programming from stations in Latin America and the Middle East. Eventually JumpTV plans to provide Joost with live streams from TV stations around the world. That will move Joost further from video on demand and closer to live TV. While sites like Myspace and eBay emphasize a dizzying array of features and options, Joost opts for minimalism. Unlike YouTube, Joost has no user-generated content. Instead of video clips of rapping grandmas, crashing skateboarders and blathering strangers, Joost focuses on network-quality programs. And unlike Apple's iTunes, which sells TV shows and movies, Joost is free, though its content is peppered with one to three minutes of ads an hour. It's a 50-year-old broadcast model updated. The controls are vintage I Love Lucy too. The basic interface has simple up-down menus so it can eventually be translated to cell phones and devices like Apple's iPod. No need for a 37-button remote. "People are tired of being locked into the way TV is set up," says Friis. Simplicity is the magic of the service, something that YouTube, with its millions of videos in thousands of categories, lacks. And it's in high demand. Steve Johnson, ceo of Choicestream, which helps video sites customize their offerings, says viewers prefer receiving personalized recommendations to wading through reams of search results. But it all comes down to what you can watch. Content is still king. While Joost now offers fewer than 50 channels, it will soon have hundreds, and eventually thousands. To keep things simple, you can stick to a few channels. Or you can open the floodgates. "Today TV is 500 channels but we're not far  maybe three years  from a 5,000-channel world," says Hilmi Ozguc, ceo of Maven, which powers Internet TV for media companies like CBS and Univision. "And in 10 years, we could easily be at 50,000 channels from all over the world. You'll have a fly-fishing channel and a channel just for Lost." Warner Music exec Alex Zubillaga says he can envision a Paris Hilton channel and one each for the Grateful Dead, Diddy and Madonna. Joost is lean-back from a content point of view, but its attractiveness to advertisers is in getting you involved. Ad execs love Internet TV because its audience is measurable, targetable and interactive. "If you spend 10 minutes learning about a new car you're interested in," Ozguc says, "that's worth gold to advertisers." By 2010, Parks Associates estimates, the online-video market will grow fivefold, to more than $7 billion. So far Wrigley, T-Mobile and Maybelline have signed on, and others may customize ads not just by location but also by viewing style. Watching Lassie, Benji and other dog flicks? Purina might have a message for you. "There's no reason why a real estate company couldn't put an ad up linking to a video walk-through of properties in your neighborhood," says David Clark, Joost's advertising director. And if you choose to, you too can do more than just watch. You can chat with friends (using existing instant-messaging services like Google Talk) in an unobtrusive transparent window while you watch a game or a mystery. Or you can vote on an American Idol�like contest. It means being able to share shows in real time with friends rather than having to wait until the next morning's watercooler chat. Or not. And this time, Friis, a Dane, and Zennstrom, a Swede, won't have every media lawyer in the U.S. waiting to sue them, as was the case with Kazaa. TV networks are pleased with Joost's advanced encryption, which they say makes it virtually piracy-proof. Joost's founders learned the importance of that the hard way: Kazaa was forced last summer to pay more than $100 million to settle copyright-infringement claims. Encryption wasn't the biggest problem in creating Joost. The primary puzzle was piecing together a network powerful enough to stream near dvd-quality, full-screen video to millions of computers simultaneously. The trick, it turned out, was to employ distributed computer power, using viewers' own PCs to speed video along. Having developed similar person-to-person networks for Kazaa and Skype  to transmit music files and phone calls through the Net  Joost's engineers finally nailed the solution last summer. Shouts of joy went up when they streamed their first video. It depicted, appropriately enough, sharks circling prey. YouTube stirred enormous buzz with its growing video community last year, and Zennstrom and Friis, who had no formal business plan, faced a quandary early in the project's development. Should they chase the user-generated-content train or go after video of a different kind? They chose the latter path, despite the dollar signs dangling from YouTube. Given the fortunes Zennstrom and Friis had already accumulated, they could afford to gamble on the venture, which they have largely funded on their own. "They're cutting edge, passionate and aggressive," says Lucas Mann, co-founder of MusicNation, an artist-development company with a music-video-contest channel on Joost. "They're cyberpunks." Whether entrepreneurs or rebels, they're certainly not idle rich, though Friis confesses he has started eating at nicer restaurants, ordering good bottles of wine and traveling business class instead of economy. And the Joost team isn't afraid to let loose. Friis admits the gang got "fairly intoxicated" celebrating the long-awaited release of their test software just before Christmas. Now, as they polish their software for its summer debut, the founders say they're juiced up about opening Joost to the world. From time to time, the billion-dollar question tugs at Friis. "I do ask myself sometimes," he says, "why I'm not sitting on some island on the beach relaxing. When this works, though, it'll all be worth the work."